The city of Sturgis, S.D. inked a deal with Harley-Davidson which is timed for this year’s 75th Sturgis Motorcycle Rally and made Harley-Davidson the official motorcycle of the rally and for the next 75 years! I don’t know if that is one of the longest-term sponsorship agreements ever written, but it might be. Many, but not all people who go to Sturgis ride Harley-Davidsons, and Harley has had a big presence in Sturgis for years. Mt. Rushmore was also the inspiration for Harley’s Project Rushmore line of motorcycles. During a news conference at the company’s headquarters, they removed a brick from the historic front entrance using a 2015 Harley-Davidson Street® 750 motorcycle. That brick, alongside one from the Harley-Davidson Museum and 73 bricks from the headquarters’ famous motorcycle-only parking area will be delivered to Sturgis on Harley-Davidson motorcycles. 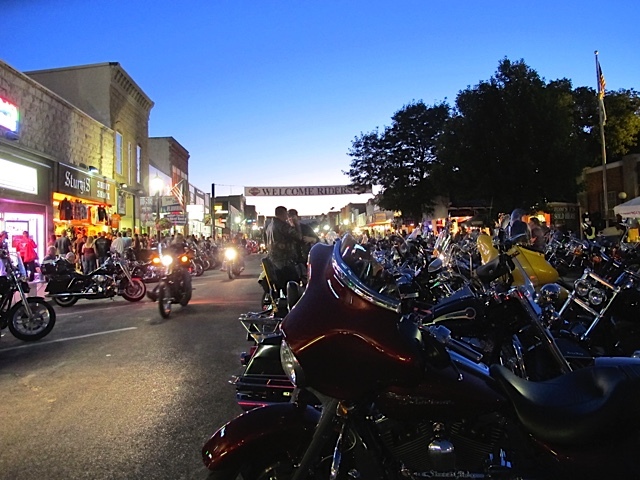 The deal with the city makes the Harley-Davidson’s footprint in Sturgis fairly permanent: there will be a Harley-Davidson-branded plaza on Main Street built with some of the bricks from the company’s century-old headquarters in Milwaukee. The venue will have a stage for concerts, and events year round. It will all be completed in time for this year’s 75th Rally. Photo taken by author in 2012.